Absorbing, rather bitter debut thriller about NASA and a team of US astronauts going up in 1999 to join Russia’s Mir space station team. 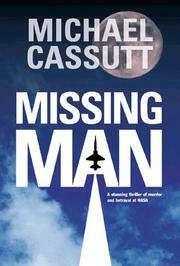 The missing man of the title is Chief Astronaut Joe Buerhle, who’s killed before the mission begins. Accompanying Buerhle in the T-38 trainer plane that he was flying when he died was astronaut Mark Koskinen, who was ejected when the usually calm Buerhle started hot-dogging over the ocean, lost an engine, was blinded by clouds, and came out—perhaps stupidly?—trying to save the plane before it splashed down and sank. Unanswered questions about the crash haunt Mark and spread gradually to his fellow astronauts and the top staff at Houston. Meanwhile, Buerhle’s ex-girlfriend, astronaut Kelly Gessner, discovers Joe’s notes on his computer—notes that point up either his paranoia or the fact that someone is trying to kill him. Then Mark’s old girlfriend, Allyson, shows up to encourage and cook for him during his recovery from the crash, although he is still on schedule for the Mir mission. Later, Allyson is killed in a highway accident. The coroners— reports on both her and Buerhle show cocaine in their blood, and the evidence slowly accumulates to suggest that both of these people were murdered when coke was injected into their food. As time passes, Mark and Kelly gather what further evidence they can, while their chief on the mission plays down their fears. Eventually, both realize that nothing they find will matter to NASA, which won—t let anything interfere with the space docking and experiments on its own agenda. The climax is a one-gun shoot-’em-up in outer space, completely unlike anything you might expect. Cassutt’s poker-faced plain style never busts the language envelope, but if it works for Tom Clancy, why not punch it out? Even so, it’s not what we might hope for from a writer for TV’s The Outer Limits, The Twilight Zone revival, and the brainspinningly experimental Max Headroom.